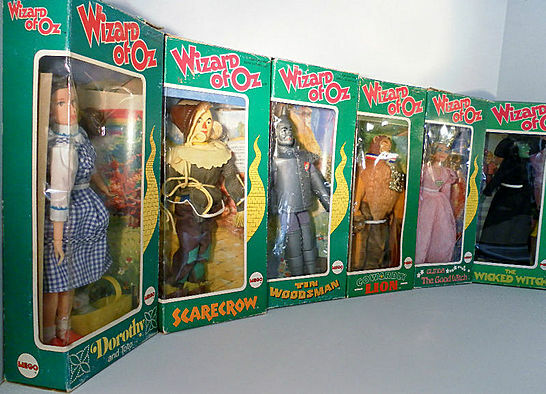 1974 Vintage 6 Mego Wizard of Oz Set Dolls Figures. Description: 8 Inch figures in 10x4.5 Inch Original Boxes. Figures in unplayed in box condition. Few of the boxes has some shelf and corner edge rub or wear. Boxes still firm and have the cellophane, a few have sticker residue on the top or lid flaps. Wicked Witch box has the notably wear with more creases and sticker residue and rubs. Otherwise boxes and figures are intact with extra accessories such Dorothy's basket and Wicked Witch broom intact. Description: Dorothy and Toto from the classic 1939 movie "The Wizard of Oz". This auction is for 2 Oz dolls. 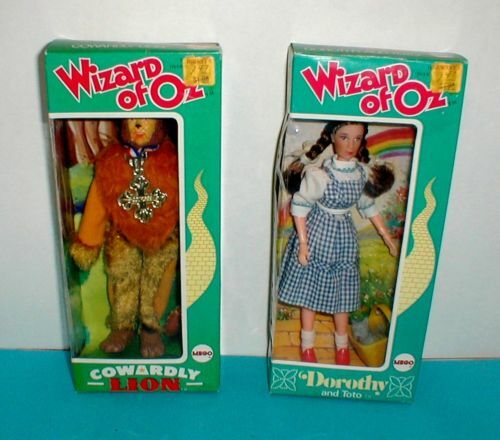 Dorothy is an 8" poseable figure. Arms, legs, head and waist bend. Comes complete with Basket and loveable dog "Toto" too. Also included is the Cowardly Lion doll. Both are in their picture boxes, made in the 1974 by MEGO !!! These were never sold to the public and was found in an old toy store warehouse. The boxes have never been opened. Dorothy is a little faded on the front of the box and a slight crease in the clear window but still displays Very Well. The doll inside is perfect. The Cowardly Lion is the same way. Slight fading but perfect doll. The clear window looks Nice. They still have their original price tags in the upper right corner. 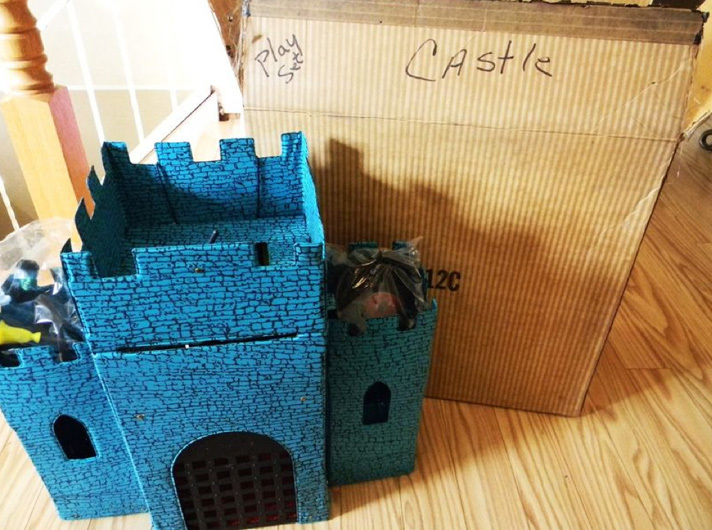 Vintage MEGO Wizard of OZ Wicked Witch Castle MINT IN Original Box "WOW"
Vintage Mego Wicked Witches Castle!!!!!!!!!!!! This is with the original box the peices are unopened. I am not a collector or know much about them but i would say it is in Mint condition does not look to be ever played with just packed away in original box. 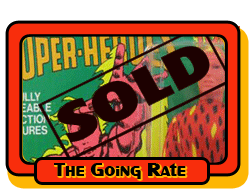 I think this is a great find for the Mego Collector or Wizard of OZ collector. The Cardboard box does have writing on it. The Original box will be shipped inside another box. Please ask any further questions you may have. 51500/3 Cowardly Lion - Complete and in unused condition (has been stored from new). The box is complete and shows only minor signs of wear. 51500/2 Tin Woodsman - Complete with axe and in unused condition (has been stored from new). The box is complete and shows only minor signs of wear. 51500/4 Scarecrow - Complete and in unused condition (Has been stored from new). The box is complete and shows only minor signs of wear. 51500/1 Dorothy and Toto - Complete and in unused condition (has been stored from new). The box is complete but the plastic frontage has suffered minor crushing. These items which enhance any collection and are extremely hard to find today in such good condition.This is a rare opportunity to purchase all four at the same time. 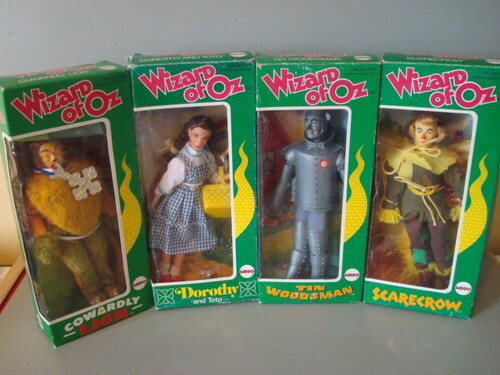 This is a rare Mego Wizard of Oz Emerald City gift set. The red box variant from the much more common blue one. Box is in very rough condition, however. Please study the pictures closely. It is my understanding that the box is where the real rarity of this item resides, so please bear in mind that it is in ROUGH condition. Playset itself is quite used. Dolls are incomplete, Dorothy's arm has been glued, some of them have loose joints and paint rubs. Several of the accessories are broken. This Mego item is in heavily used condition, but could be used for parts, customizing, etc. Email me with questions and thanks for looking. I'd love to pick up a full set of those individual boxed figures up one day.